Online registration is closed; however, you can register on-site on Saturday at the Goat and Hair Sheep Field Day. See you there! Our annual Goat Field Day will be held on Saturday, April 28, 2018 at the Langston University Goat Farm with registration beginning at 8:00 a.m. Recently, Langston University added a small research flock of Dorper, Katahdin, and St. Croix hair sheep and this year we will incorporate topics of interest to hair sheep producers. This year's theme will be Preventing Production Losses and our featured speakers will be Mr. Matthew Branan, Dr. David Pugh, and Dr. Jim Keen. Matthew Branan earned his MS in Statistics from Colorado State University in 2015. His thesis focused on applying information criteria-based model averaging and pseudo-R2 metrics for linear mixed model evaluation. Throughout his last year at Colorado State University, he worked as a cooperator statistician for the Surveillance Design and Analysis (SDA) unit, within the Center for Epidemiology and Animal Health (CEAH). As a collaborator with SDA, Matthew helped to modify, develop, and implement Bayesian models for applications in disease freedom and prevalence estimation settings in the swine, cattle, aquaculture, and equine industries. In August, 2016, he began working for the National Animal Health Monitoring System (NAHMS). He is currently involved in all stages of implementing national studies related to animal health in a variety of industries including aquaculture, swine, cattle, sheep, goat, beef cow-calf, and dairy cattle, with particular focus on the design of the studies and the analysis of study results. The focus of his statistical work currently centers on the use of survey weights in estimation and in linear and Bayesian models. David Gartrell Pugh earned both DVM and MS (Nutritional Physiology) degrees from the University of Georgia in 1981, and a MAG in Agricultural Entomology (external parasites- 2013). He received post-DVM training at Virginia Tech (Clinical Nutrition) and Texas A & M University (Theriogenology). He is a Diplomate of the American College of Theriogenology (1986), the American College of Veterinary Nutrition (1992), and the American College of Veterinary Microbiology (Parasitology 2012). He has held faculty positions at the University of Georgia and Auburn University, owned a large animal practice in Georgia, has been a consulting veterinarian for Fort Dodge Animal Health and Pfizer Animal Health, project veterinarian and Director of Farm Operations for the AU Equine Source Plasma Project (a multi million dollar research grant), and is currently Director of the Al Vet Diagnostic Lab System. During his academic career he taught veterinary nutrition for horses, cows, and small ruminants, and was a clinician in ambulatory medicine and theriogenology. He is the author of >600 publications, >100 book chapters, 2 textbooks (Sheep and Goat Medicine, Sheep and Goat Medicine, 2nd ed), and a co-author of a publication of the NRC (NRC for Sheep, Goats, Camelids and Cervids). Pugh has received five university and five national awards for teaching, was the 2006 recipient of the UGA’s AM Mills Award for contributions to Veterinary Medicine, and was the UGA’s College of Vet Med’s Alumni of the Year for 2017. He has served on various committees for the American Association of Small Ruminant Practitioners, the Society for Theriogenology, the College of Theriogenology, the American College of Veterinary Nutrition, and the National Research Council, Nutrient Requirement Committee and the American Academy of Veterinary Parasitologists. He and his wife of 43 years are sheep, goat, and donkey/mule owners, part-time motorcycle/trike builders and riders, and the father of two daughters, a son, 2 sons-in law, a daughter-in-law, and 4 grandchildren. Jim Keen earned a DVM and PhD (epidemiology) from the University of Illinois and is a veterinary infectious disease eco-epidemiologist and sustainable agriculture proponent with broad interests and 27 years of research and field experience in livestock health and production medicine, veterinary public health and zoonotic infections, biomedicine and animal protection. He currently is a faculty member at the University of Nebraska-Lincoln in the School of Veterinary Medicine and Biomedical Sciences. Much of Keen’s research interest has focused on the diagnosis, epidemiology and control of infectious diseases of sheep and goats, especially Caprine Arthritis and Encephalitis virus, Ovine Progressive Pneumonia virus and Caseous Lymphadenitis. In addition, he kept a small (10-20 does) hobby herd of Alpine and Pygmy goats for 20 years. Keen is author or co-author of 70 peer-reviewed scientific publications and more than 100 scientific abstracts. Keen taught high school science in Togo, West Africa for two years in the 1980s. From 2007 to 2014, he was a disease surveillance consultant on dangerous veterinary pathogens (zoonoses and transboundary diseases eg brucellosis and foot and mouth disease) in Azerbaijan and Armenia for the Biological Threat Reduction Program of the US Department of Defense. Adult Activities (afternoon session): In the afternoon session, participants will break into small-group workshops. There will be a total of fourteen workshops; however, participants will only have time to attend three. Tools in the War on Parasites with Dr. David Pugh. Common Diseases of Small Ruminants and Their Symptoms with Dr. James Keen. Where Are They Going? A Look at Past and Future NAHMS Goat and Sheep Health National Studies with Mr. Matthew Branan. Basic Herd Management –hoof trimming, body condition scoring, FAMACHA scoring, etc. with Mr. Jerry Hayes. Goat and Sheep Farm Budgeting - basics of budgeting and financial recordkeeping with Mr. Clark Williams. Pack Goats - basic goat training as a pack animal and equipment needs with Mr. Dwite Sharp. Tanning Goat Hides - basic tanning and leather treatment of goat skins with Dr. Roger Merkel. Nutrition for Health and Production - calculation of energy, protein and feed intake requirements with Dr. Steve Hart. DHI Training - supervisor/tester training for dairy goat producers including scale certification with Ms. Eva Vasquez. Fitting and Showing for Youth and Adults - tips and pointers on fitting and show ring etiquette with Ms. Janet and Messrs. Robbie and Coleman Sanders (this is a half-day afternoon workshop). Registration for the Goat and Hair Sheep Field Day is FREE but there is a $10.00 per person charge for the optional lunch of barbecued goat and goat milk ice cream. You can bring your own lunch, if you desire. Regardless of lunch preferences, we ask everyone to pre-register. Please make checks payable to "Langston University/Research Sales". Goat Field Day Program for Kids (Old Fashioned Fun): The Goat Field Day for Kids provides the opportunity for kids to explore and enjoy “old-fashioned fun activities” while their parent(s) participate in the Goat Field Day Program. With all of today’s technological gizmos from the iPod to high-end smart phones and handheld games, most kids are no longer exposed to the old-fashioned games and activities that shaped the imaginations and innate creativity of their parents and grandparents. The Goat Field Day for Kids Program is intended to challenge and enhance cognitive and social skills. The development of intellectual and socialization practices have been determined as prerequisites for helping children to learn more complex concepts, thereby enhancing their personal capabilities. Cheesemaking Workshop:Our ever-popular goat milk cheesemaking workshop has been scheduled on Friday April 27, 2018 (the day before our annual goat field day on April 28). 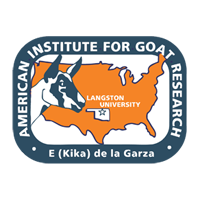 Dr. Steve Zeng, Professor and Dairy Product Specialist in the American Institute for Goat Research at Langston University, will be the host/instructor for this workshop. He has instructed cheese workshops in many states as well as internationally. He has also judged cheeses for the World, the United States, the American Cheese Society and the American Dairy Goat Association cheese championships/contests since 2007. He will share his rich background, personal experience and masterful skills in small-scale cheese manufacture, particularly goat milk cheeses. He plans to demonstrate basic principles and practical skills of making soft and surface mold cheeses using our own Grade “A” goat milk. Milk quality, cheesemaking facility, cheese sensory evaluation and federal safety requirements will also be discussed. This one-day hands-on workshop will be held in the pilot creamery at Langston University. There is a registration fee of $60.00/person, which includes continental breakfast, break snacks, and lunch consisting of goat meat BBQs, sausages, jerky, goat milk ice cream and cheeses, etc. Only the first 15 registrants will be admitted. To reserve a seat, please send your personal check of $60.00 to LU Ag Res. Sales (Attn: Dr. Steve Zeng, Department of Agriculture & Natural Resources, P.O. Box 1730, Langston, OK 73050). For information regarding the cheesemaking workshop, please contact Dr. Steve Zeng at 405-466-6145 (O), 405-404-5171 (M), or szeng@langston.edu. For information regarding the 2018 Goat and Hair Sheep Field Day, please contact Dr. Terry Gipson at 405-466-6126 or tgipson@langston.edu.